Alfie was a young male cat, he’d put on a bit of weight since his castration 18 months ago and his energy levels weren’t the best, he enjoyed lazing on the sofa more than the outdoor life. His owners noticed one day that he was in and out of his litter tray by the minute and seemed unable to get comfortable. Alfie was normally a very clean cat but that day his owners found him sat straining to toilet in all sorts of unusual places around the house, they also found several small spots of blood but could not work out where they had come from. They thought nothing of Alfie’s strange behaviour. Two days passed and Alfie was becoming very quiet and not wanting his food. He stopped coming for cuddles and became very lethargic, during that evening his owners phoned the vets as he was barely able to stand. He was rushed into Nantwich Veterinary Hospital where he was diagnosed with a ‘blocked bladder’. He had not been able to pass urine for three days which led to his kidneys beginning to fail and his blood potassium to rise to a dangerously high level. Because of this he had become a very weak and a very ill cat. Alfie had to undergo emergency treatment, his body had gone into a state of shock and he needed stabilising quickly- high potassium levels affect the heart and can cause death. Intravenous fluids were started along with a ‘cocktail’ of drugs, to bring his potassium levels down, and begin reversing his kidney failure. A urinary catheter was placed to relieve the blocked bladder and enable urine to be passed once more. Urine samples showed small crystals (struvite) had developed in his urine, causing the obstruction. This is a common condition in cats. Alfie remained in a critical condition in intensive care for several days before slowly starting to show signs of improvement. His kidneys started to function properly once more and he was given a special diet to stop the formation of crystals in his urine. After 10 days in the hospital Alfie was able to go home. Unfortunately cats affected with this condition are susceptible to recurrence, he will need to be monitored very closely and remain on a special diet. His owners are also encouraging him to lose weight, be more active and drink more water, because overweight and inactive cats are more at risk of this problem developing. Alfie was very lucky, he could have died from this condition. 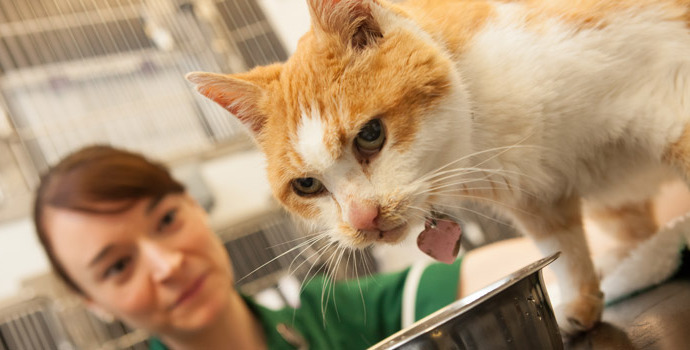 We recommend if you notice any changes in your cats toileting habits to contact the surgery for an appointment, as prompt treatment can avoid such a life-threatening condition from developing.